Create the sophisticated table arrangement of your dreams with this Cherry Blossom Dish from the Blooming Blue and White Cherry Blossom Dinnerware Set. This Japanese dish has a unique shape and size that makes it incredibly functional for any type of cuisine. Serve pasta, a main course, or salad in this mid-sized dish with lightly sloping sides and an undulating rim. This Cherry Blossom Dish is a fantastic complement to the Cherry Blossom Dinner Plate from the same Japanese tableware collection. 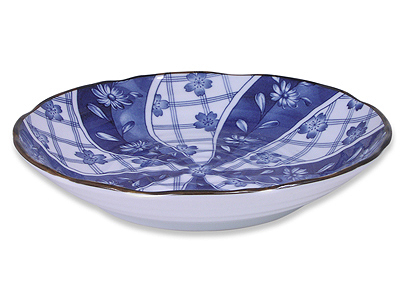 The inside of this Cherry Blossom Dish has a distinct blue and white design. The background has alternating patterns. The first is a careful blue and white plaid and the second a cheerful, light blue. Scattered across this vibrant backdrop are cheerful cherry blossoms at the height of their blooming. As a traditional symbol of life’s delicacy and joy, Asian tableware with cherry blossoms makes for a great gift. Finished in a glossy, smooth glaze this mid-sized dish is certainly beautiful, but it is also functional. This Cherry Blossom Dish is made of quality Japanese ceramic and both dishwasher and microwave safe. Planning to send this Cherry Blossom Dish for a housewarming or wedding? Consider the stunning set for six, also found through Mrs. Lin’s Kitchen.